Alright, watch real close as we will show you how a four way Stud Eight or Better hand goes down with two players all in. And we shouldn't forget to mention that there's also side pot action. As you can see a lot of cards were dealt, and the action started with with Christopher McHugh who brought it in for 5,000 with the . Greg Mueller raised it up to 20,000, Konstantin Puchkov made it 40,000 and Joseph Couden put in a fourth raise to 60,000. The action was now on McHugh who moved all in for his remaining 64,000. Mueller called this raise and Puchkov capped it for a total of 80,000 with just 7,000 chips left behind. Both Mueller and Couden called. 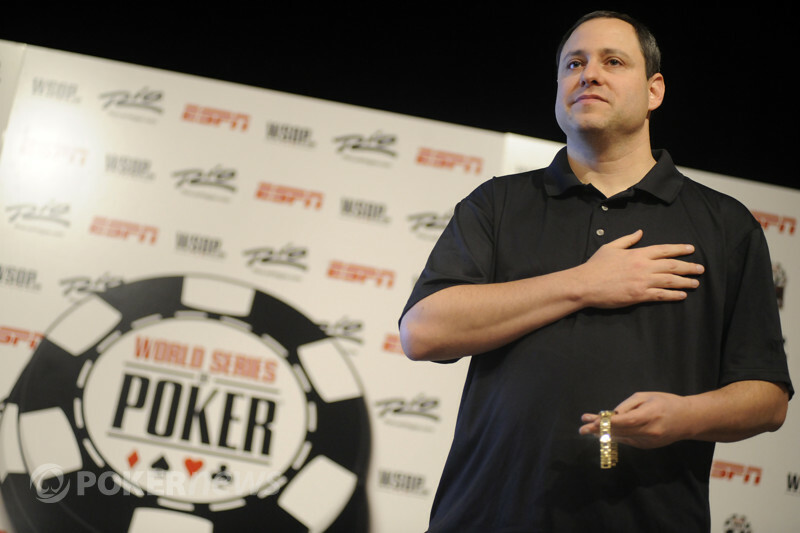 On fourth street Puchkov got his last chips in, Couden made it 20,000 and Mueller called. When fifth street came around we had two all in players, and betting on the side. Both Mueller and Couden checked to sixth street where Couden bet 40,000. Mueller now raised it up to 80,000 and his opponent called. Seventh street was dealt down, and Couden called another 40,000. Mueller turned over for trip tens and Couden mucked his hand. Puchkov showed and McHugh got up out of his seat. He showed and was done. Puchkov and Mueller chopped the main pot. 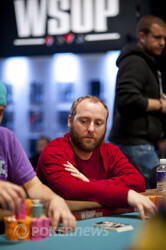 McHugh got eliminated in seventh place while Couden took a big hit, and Mueller extends his chip lead. Puchkov stays alive and is still the short stack.